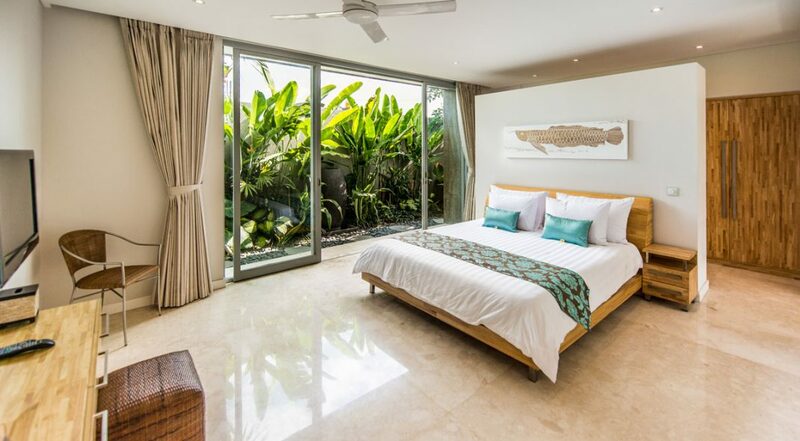 From $ 494 $ 395AUD per night We have direct contracts with most villa owners. We don't add any booking fees. We are 100% transparent with no nasty surprises. 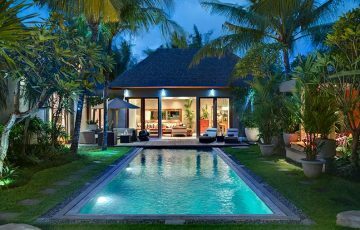 Villa Damai is a 3 bedroom Seminyak holiday villa rental & presents exceptional tropical holiday living at an exceptionally reasonable price. 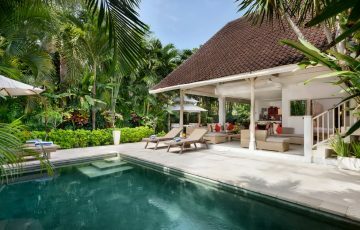 The villa is located in a secure private villa complex that ensures peace and quiet and a rejuvenating holiday experience. 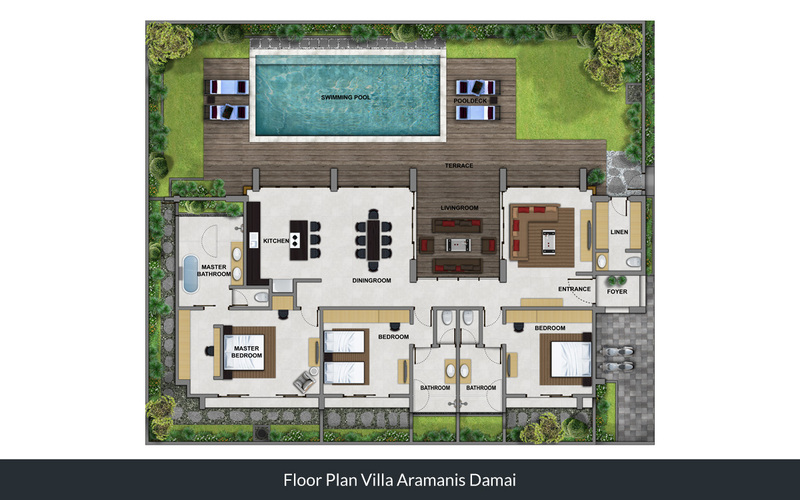 Featuring the best of modern design and modern living amenities, Villa Damai at Aramanis will suit any discerning traveller. 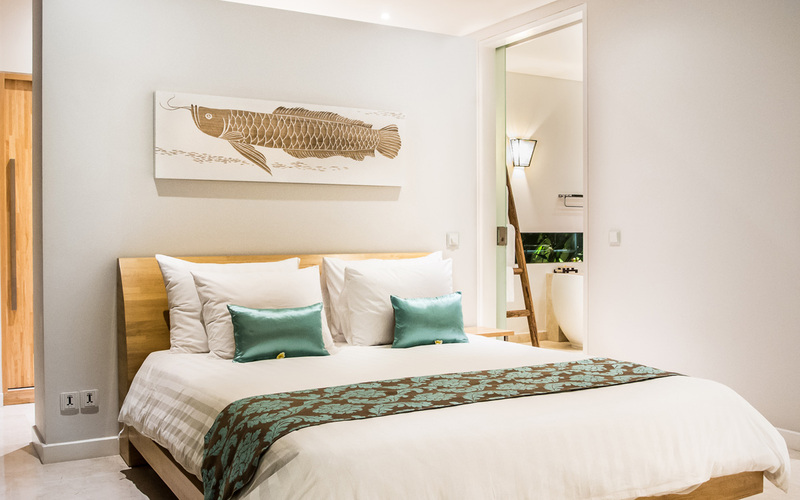 3 bedrooms accommodate 6 guests and the prime location facilities easy access to all the best parts of vibrant Seminyak and bustling Legian. 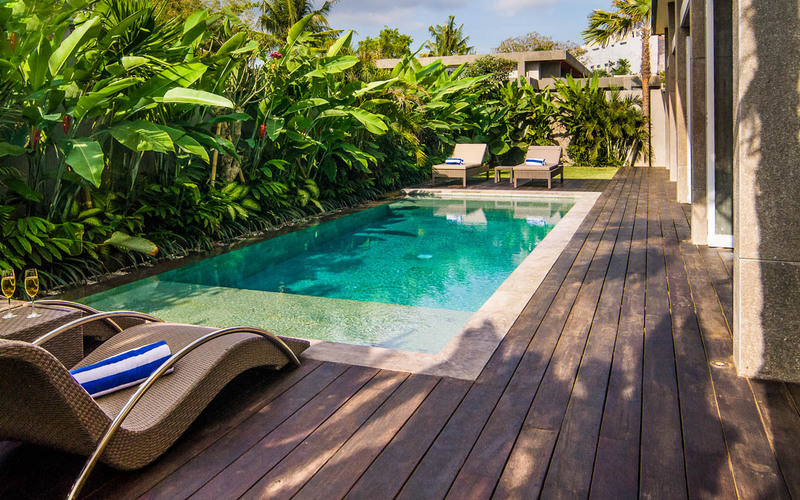 A lovely hardwood decking wraps itself around the pool, at one side a high perimeter wall is bustling with tropical flowers and palms and each end of the pool stylish rattan sun lounges lay in wait for your total enjoyment. 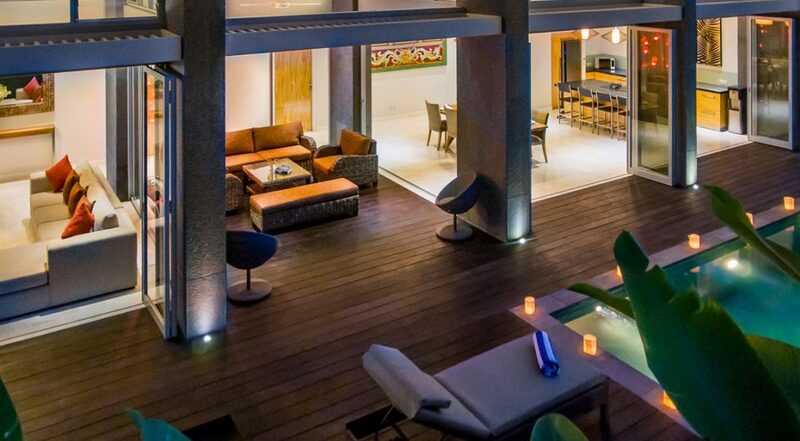 Sit back and soak up the tropical ambience as your friendly butlers serve you cold drinks and snacks. And if that doesn’t suffice ask your personal chef to prepare a BBQ banquet for the family. 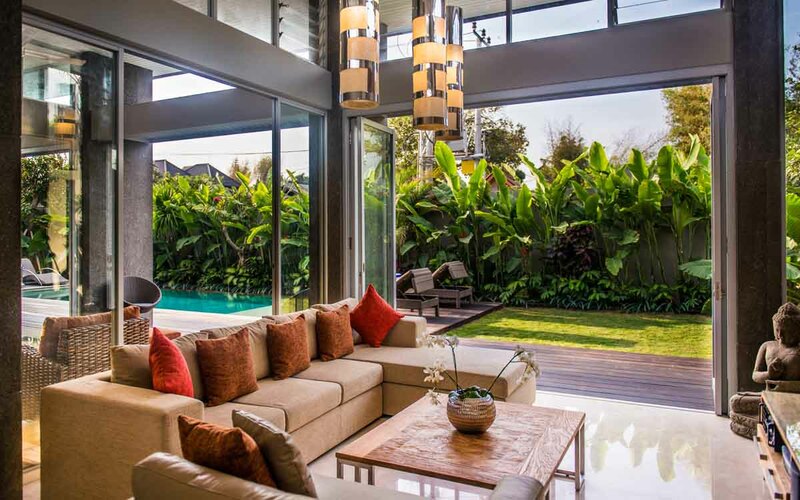 Villa Damai is privy to smart design, a series of floor to ceiling glass partition walls allow you to separate the living spaces and relax in air-conditioned comfort or create the perfect alfresco open-air experience. 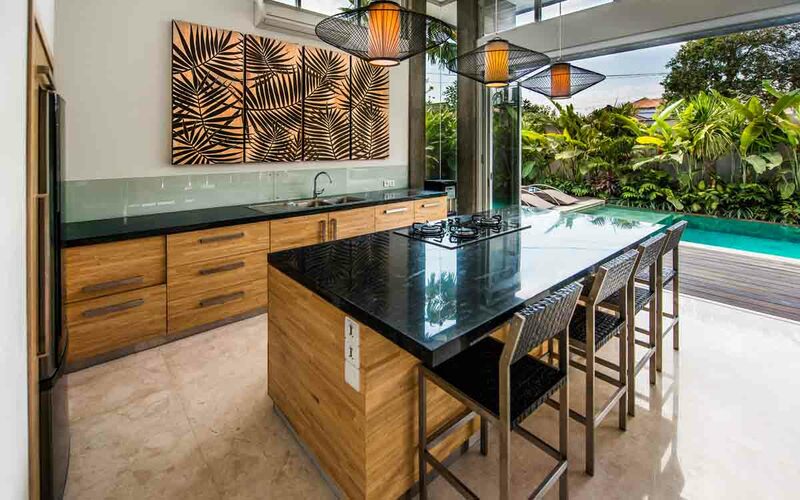 The first section of the versatile open plan living area features a western kitchen, lovely granite bench tops and an island bar with stools to watch cooking proceedings. 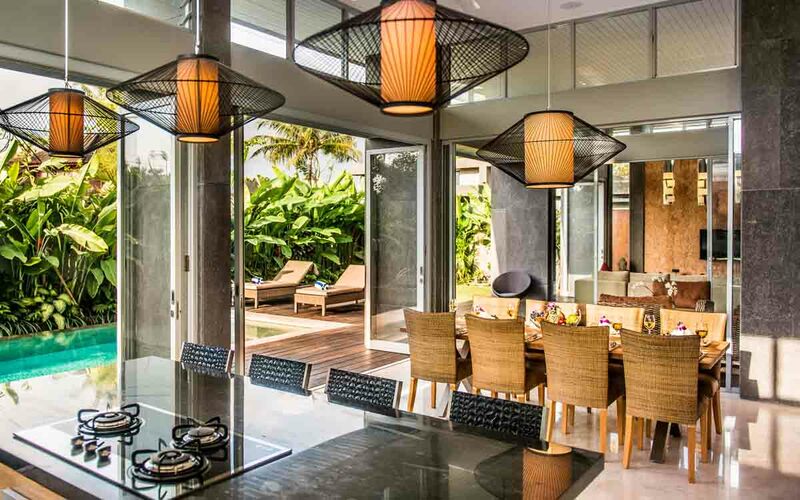 A large dining table for 8 guests sets an elegant scene and then an outdoor alcove with a rattan sofa can be accessed by sliding back the glass partition. At the far end a comfy suede sofa offers a comfortable place for all to watch a movie before retiring to the privacy of your bedrooms. 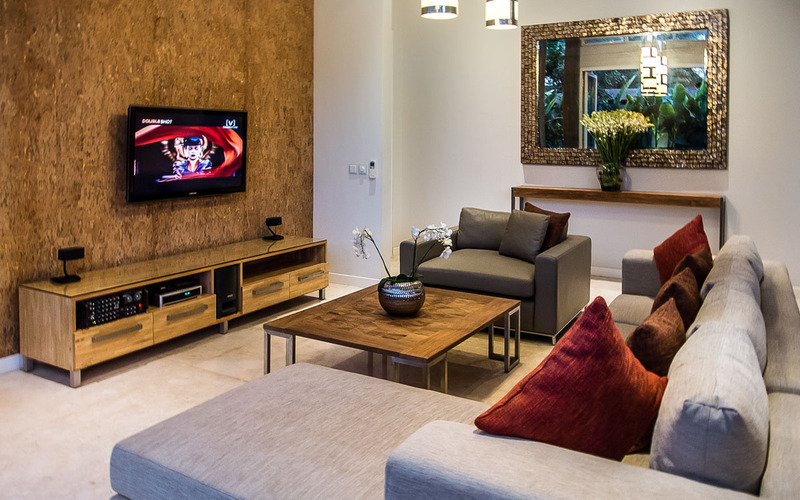 Guests will enjoy the entertainment system consisting of an LCD TV, DVD/CD player surround sound system, and iPod docking station. 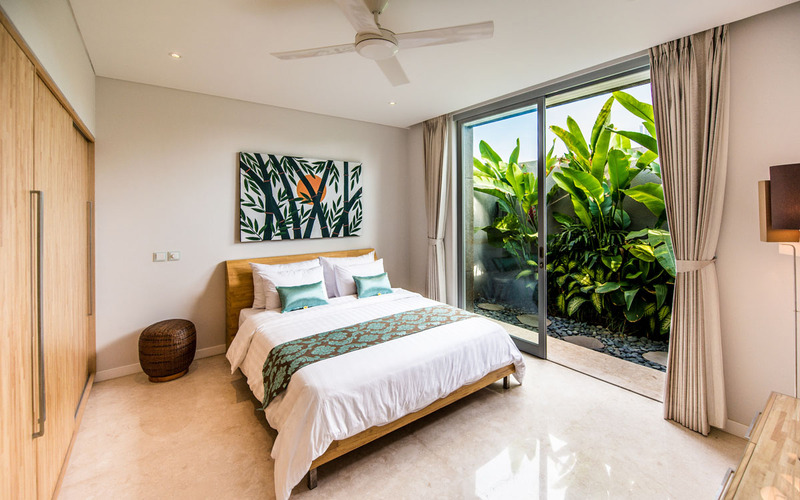 The three bedrooms are exceptionally spacious, clean and bright, featuring minimalist timber furnishings, built in robes, flat-screens with DVD/CD. 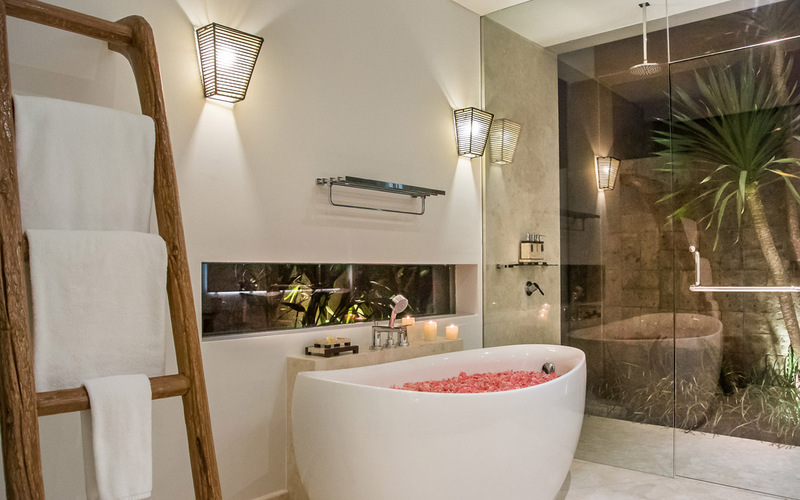 All rooms feature lovely private en-suites and the master boasts a stand –alone soaking tub, twin vanities and a monsoon shower. 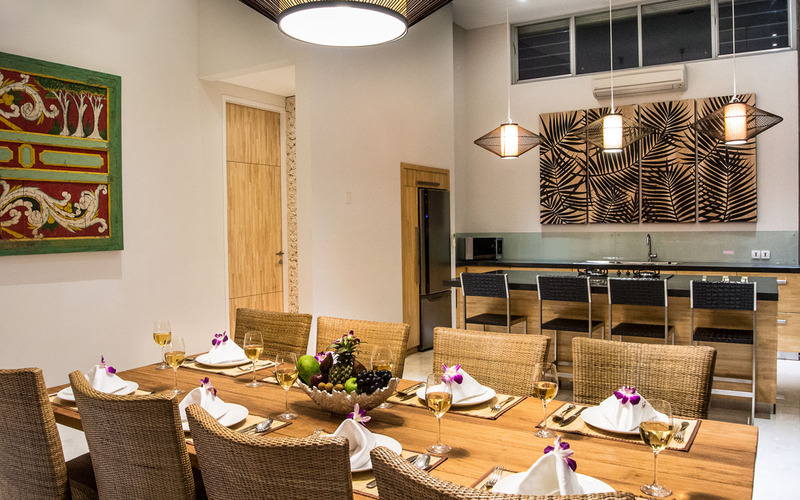 Choose between air-conditioned comfort and the ceiling fans to stay comfortable throughout the night. 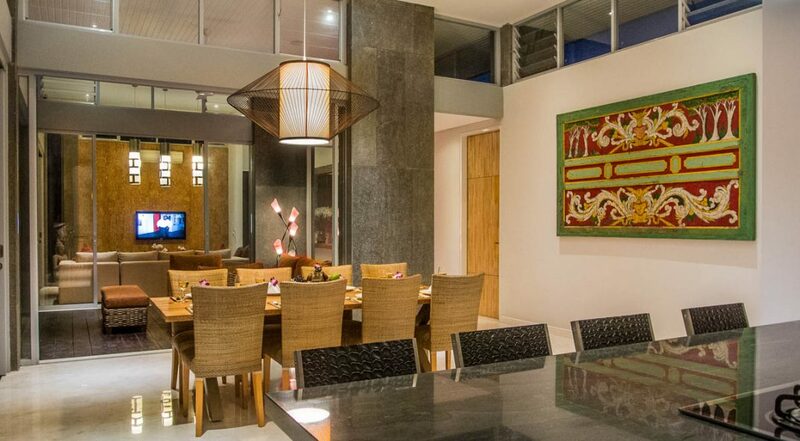 The complex of villas is staffed by a well trained team of enthusiastic and warm Balinese staff. 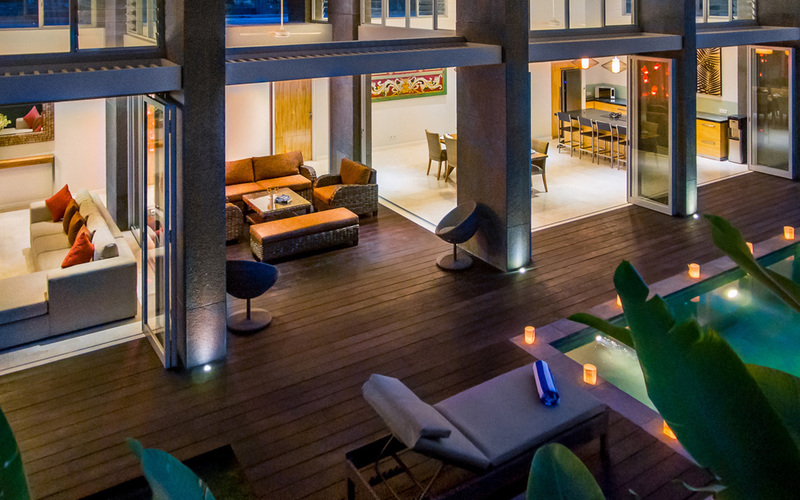 There is 24 hour concierge and a dedicated butler service so all you have to do is call the reception and the staff will be on your doorstep to attend to your every need. 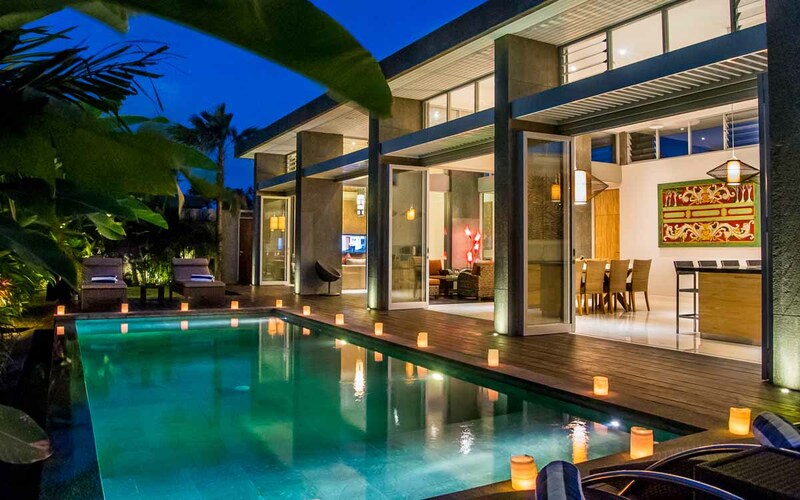 Villa Damai is located in a private villa complex just off Jalan Plawa which brings you to Jalan Raya Seminyak where you will be spoilt for choice, endless chic boutiques, cafes, restaurants, day spas are all within easy reach. 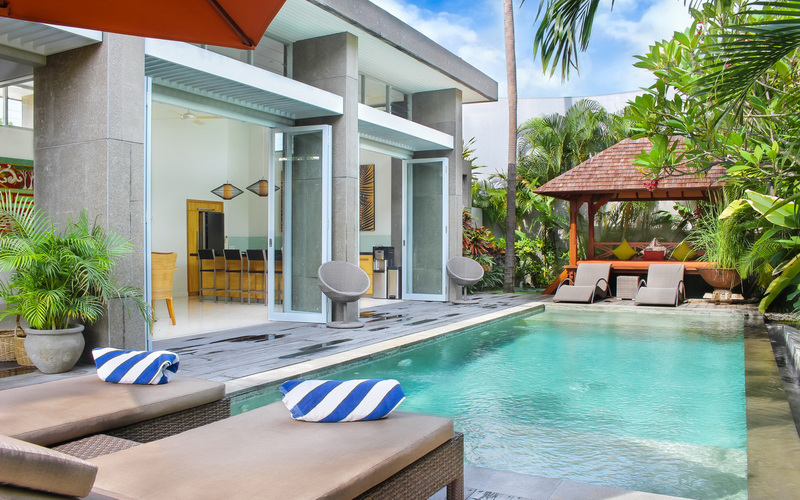 Continue straight across Jalan Raya Seminyak down Jalan Camplung Tanduk and you will pass loads of cafes and restaurants as well as the beach where you can come every day to watch those fabulous Balinese sunsets. 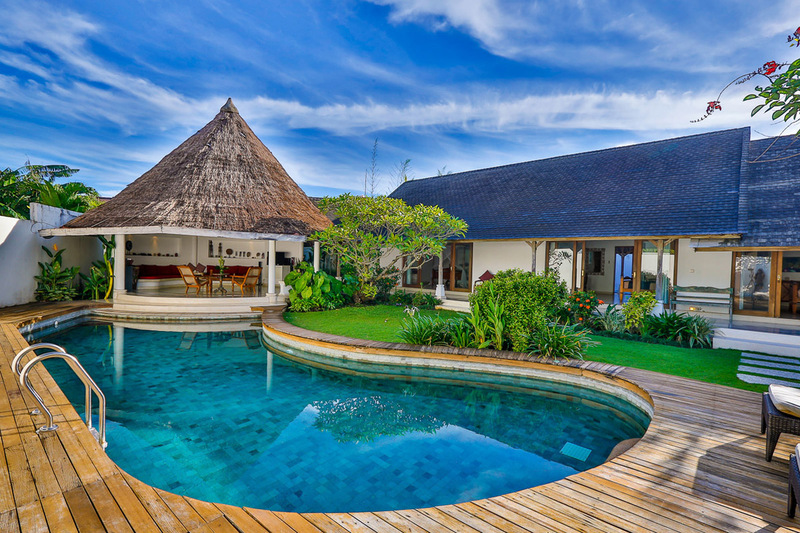 Basically you are right in the heart and vibrancy that Seminyak is so famous for. If your travelling with kids then the Waterbom Park and Finns Recreation Park are also nearby. Getting there is easy by taxi. 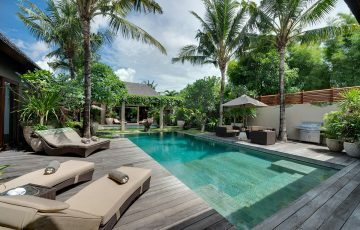 To view other Seminyak villas in a fabulous location or our full range of Bali villas to rent please browse this website or contact our reservation team. 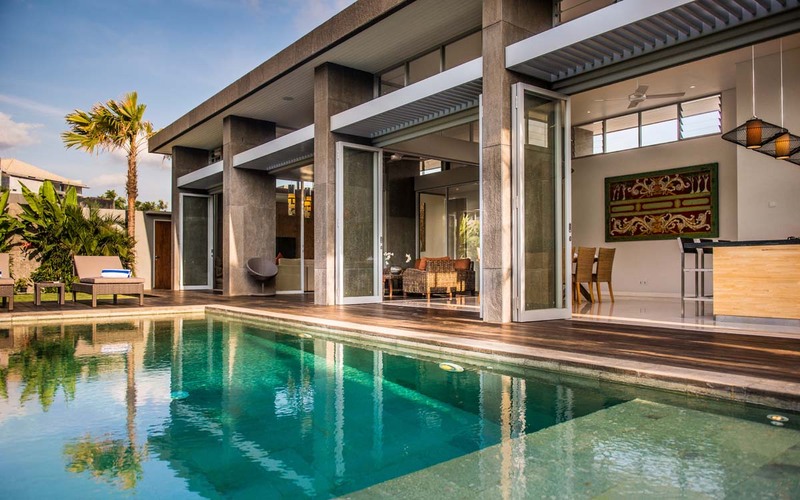 This is a popular Seminyak holiday villa rental so please book Villa Damai well in advance, especially if your planning a holiday to Bali during peak Australian school and public holidays. 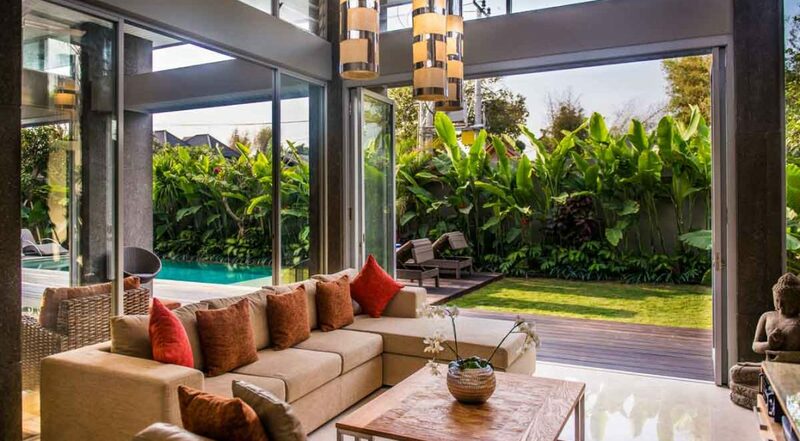 This is a very well furnished villa that looked absolutely fabulous. We loved the central location yet found that it was extremely private and tranquil - we couldn't hear anything outside. The kitchen and deck area were great as we could relax by the pool while having lunch and breakfast (We went out to the nearby restaurants most nights - they were literally minutes away). 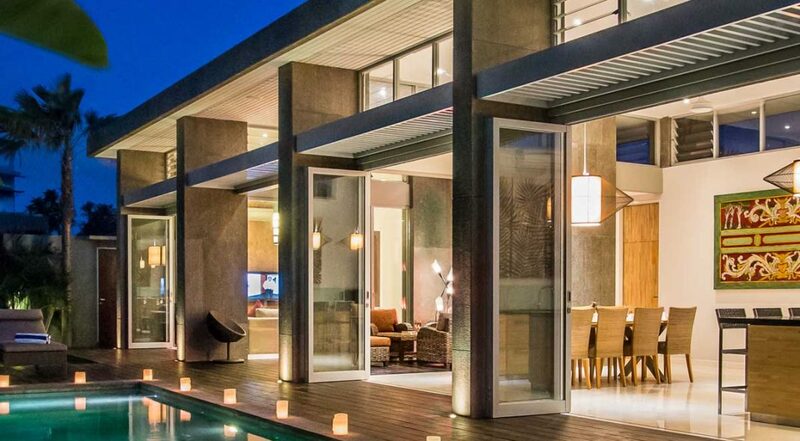 This villa had all the holiday must haves and we were immediately impressed from the moment we saw it. The kids loved the pool area and were loving every moment spent there. The Villa staff ( Wayan and Made) were super friendly and they did a great job of looking after the family - great breakfasts daily!! 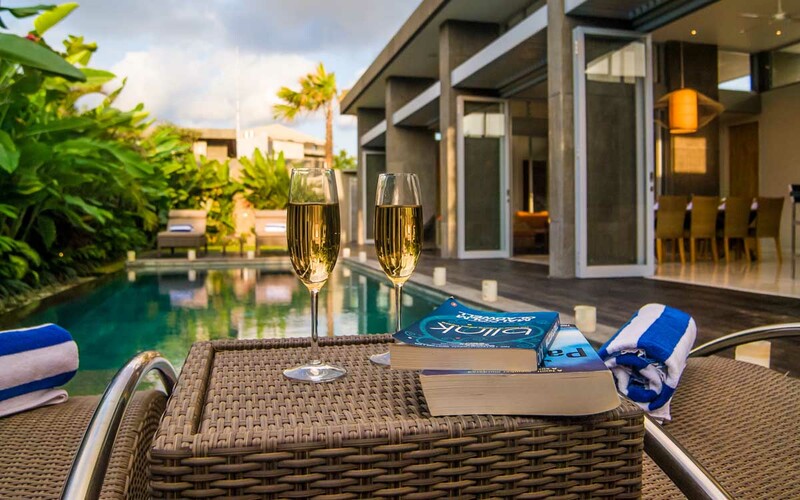 All around a great package and a wonderful holiday made even better by the stay at Villa Damai. For the price this was really good value. We did our research and this was the best by far. We spent 8 days here with another family and their 3 children and the experience was magical. 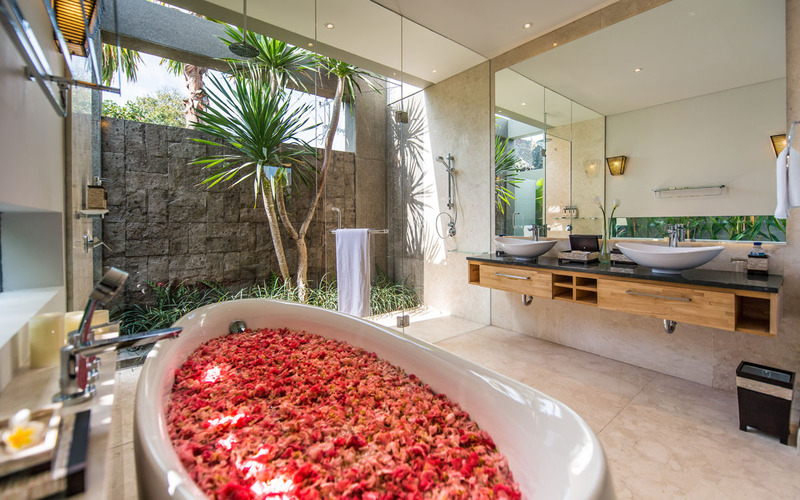 The villa is luxurious and had everything we could have ever wanted for the perfect holiday in Bali. Rooms were spotless and the pool area was always immaculate. This was our first villa experience and from now on we are always going to come back here - this villa gets a 10 out of 10. An amazing villa in a central location - friendly staff combined with a gorgeous pool and modern villa made this a fantastic holiday. 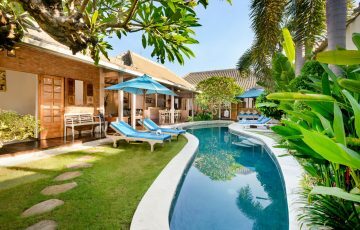 Our family recommend this villa very highly. 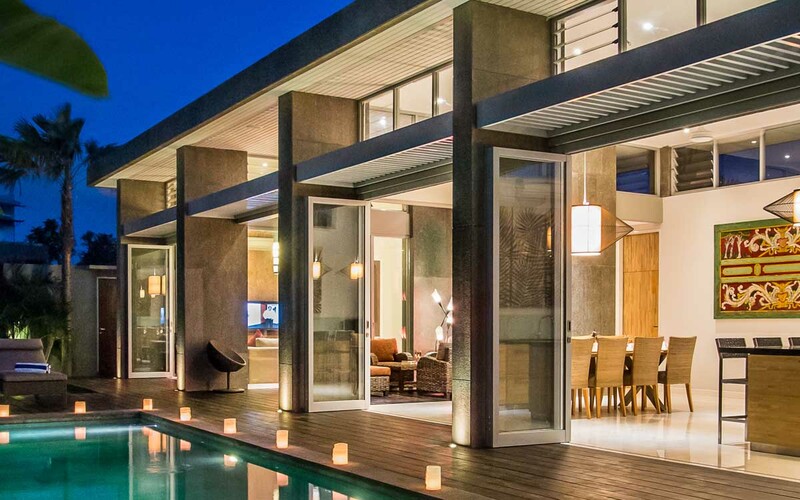 What a great surprise this villa was. We loved the photos we saw on this website so our expectations were fairly high. It didn't disappoint. Beautiful in every way. Clean, very modern and just right for our group holiday. I really want to highlight the staff here. They are incredibly friendly and always went out of their way to make us feel special. They even prepared a birthday cake surprise for my son who turned 6. This is the level of service we got. 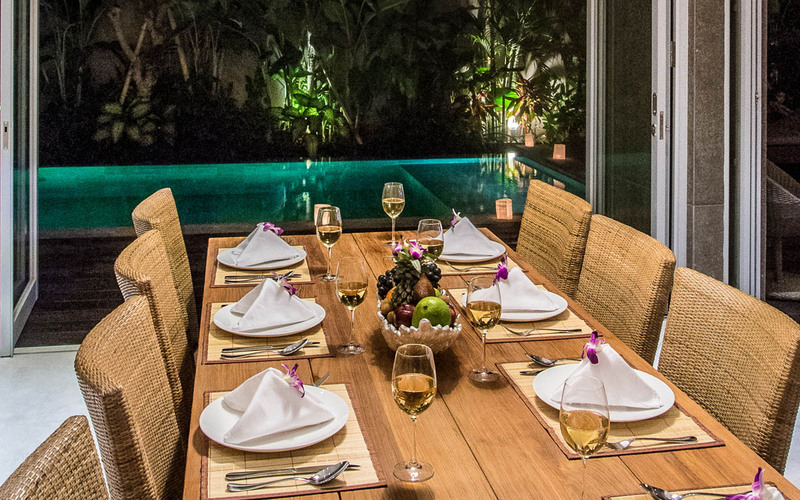 The place large, contemporary and well maintained with ultra professional villa staff. We spent 8 days here with our young kids and we were really happy that the rooms did not open to the pool for safety concerns. Other than that, everything was smooth sailing and really enjoyable. 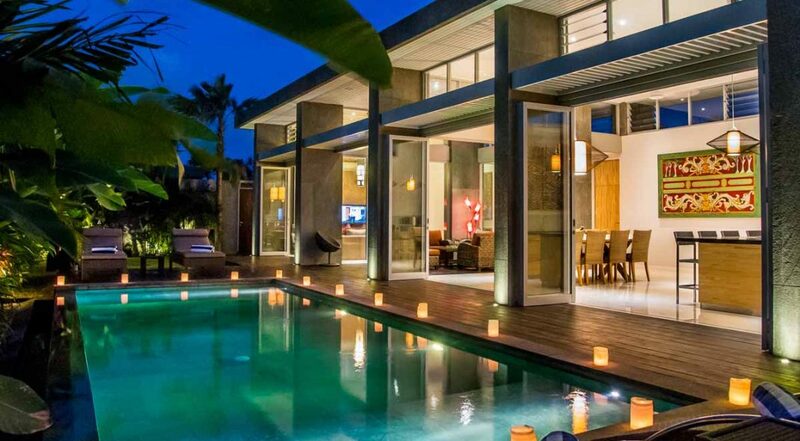 More than happy to recommend this lovely villa. 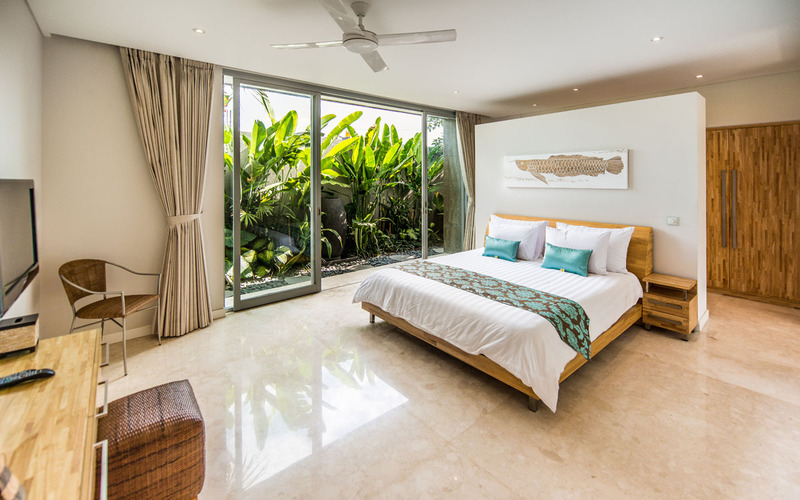 We have just returned from our third stay at Villa Damai and are planning to come back gain. We just love it here.